It is one of the great ironies of biochemistry: life on Earth could not have begun without water; yet water stymies some chemical reactions necessary for life itself. 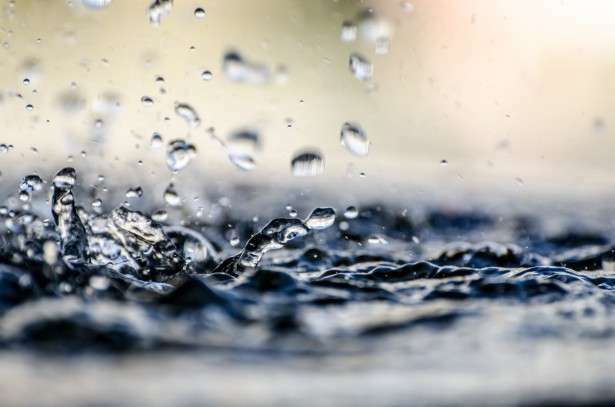 Now, researchers report today in Proceedings of the National Academy of Sciences, they have found a novel, even poetic solution to the so-called "water problem" in the form of miniature droplets of water, formed perhaps in the mist of a crashing ocean wave or the clouds in the sky. The water problem relates primarily to the element phosphorous, which is attached to a variety of life's molecules through a process called phosphorylation. "You and I are alive because of phosphorus and phosphorylation," said Richard Zare, a professor of chemistry and one of the paper's senior authors. "You can't have life without phosphorous." Phosphorous is a necessary ingredient in many molecules critical for life, including our DNA, it's relative RNA and in the molecule that makes up our body's energy storage system, called ATP. But ordinarily water gets in the way of producing those chemicals. Modern life has evolved ways of sidestepping that problem in the form of enzymes that help phosphorylation along. But how primitive components of these molecules formed before the workarounds evolved remains a controversial and at times slightly oddball subject. Among the proposed solutions are highly reactive forms of extraterrestrial phosphorous and heating powered by naturally occurring nuclear reactions. Microdroplets solve the phosphorylation problem in a relatively elegant way, in large part because they have geometry on their side. It turns out that water is mostly a problem when the phosphate is floating around inside a pool of water or a primitive ocean, rather than on its surface. Microdroplets are mostly surface. They perfectly optimize the need for life to form in and around water, but with enough surface area for phosphorylation and other reactions to occur. In fact, the large amount of surface area provided by microdroplets is already known to be a great place for chemistry. Previous experiments suggest microdroplets can increase reaction rates for other processes by a thousand or even a million times, depending on the details of the reaction being studied. Microdroplets seemed like a possible solution to the water problem. But to show that they really work, Zare and his colleagues sprayed tiny droplets of water, laced with phosphorous and other chemicals, into a chamber where the resulting compounds could be analyzed. They found several phosphate-containing molecules occurred spontaneously on these lab-made microdroplets without any catalyst to get them started. Those molecules included sugar phosphates, which are a step in how our cells create energy, and one of the molecules that make up RNA, a DNA relative that primitive organisms use to carry their genetic code. Both reactions are rare at best in larger volumes of water. That observation, joined with the fact that microdroplets are ubiquitous – from clouds in the sky to the mist created by a crashing ocean wave – suggests that they could have played a role in fostering life on Earth. In the future, Zare hopes to look for phosphates that make up proteins and other molecules. Even if he can produce those compounds, however, Zare does not believe he and his colleagues will have found the one true solution to the origin of life. "I don't think we're going to understand exactly how life began on Earth," said Zare, who is also the Marguerite Blake Wilbur Professor in Natural Science. Essentially, he said, that is because no one can go back in time to watch what happened as life emerged and there is no good fossil record for the formation of biomolecules. "But we could understand some of the possibilities," he added. Did meteorites bring life's phosphorus to Earth? We will eventually find several plausible ways for complexity to move from chemistry to life . We will never know precisely which route was taken on Earth.